The is a revised update of an early Everyman edition of Snorri's Heimskringla that was originally translated by Samuel Laing in the 1840s. The revisions are done by Jacqueline Simpson and Peter Foote, who for some strange reason revise the prose texts and supply new introductions but leave Samuel Laing's strange verse adaptions of Scaldic Poetry untouched, which in my opinion would have benefited from from a complete rewrite.This huge compilation of Norse Kings Sagas is made up of sixteen sagas that begin in the legendary Scandivian past at terminate in the thirteenth century. I found the Ynglinga saga to be the most interesting because it recounts the legendary history of the Norwegian kings and tells the story of the war between the Æser and Vaner. Also enjoyable was Harald Hardrada's saga, which tells of his invasion of and death in Yorkshire, prior to the Battle of Hastings.If my book collecting wasn't mostly focused on Medieval Literature, I would collect the Everyman editions and probably save myself a fortune because they're so inexpensive to find. Many years ago, I worked voluntary in a charity shop and the company policy was to throw all Everyman Classics away because there was so many of them and people didn't want them. which I just found sinful. So I rescued/stole this edition from the bin and have lovingly treasured it ever since. First of all, let me say that I can't imagine reading this on a Kindle. It's 800+ pages long and, if you're looking for action, boring. But it is a wonderful example of Scandinavian medieval literature. If you can get into the rhythm of it, the translator has done an excellent job of making it easy to read. Because it is medieval, it's hard sometimes to keep track of who is who. The author assumes you know (or remember from previously) who so-and-so is. Also there are little "stories" put in the middle of a king's saga that don't really relate to the rest. They just happened during that king's reign and were, to the author, important to mention.Since I have a degree in medieval literature (European rather than Scandinavian), I really enjoyed the book. I didn't have trouble when the author swings into a poem written to commemorate a particular action (kind of like a musical, I guess - time to break into song!!!). But it won't be for everyone since it is history and not action-packed.If you are of Norwegian descent or a reader of medieval literature or interested in the medieval point of view of kingship and Scandinavian society, pick it up. It's worth it. Really interesting and a really valuable link to the past, but my eyelids hung heavy and often and getting through this was more of a chore than a pleasure. I wouldn't attempt this if you are new to the saga's if only for it's sheer size. Start with The Vinland Sagas. It's much more intruiging, with less focus on the kings, and more on commoner's--of the highly entertaining kind--lives and voyages, and it's a one-sitting kind of saga whereas the Heimskringla will soon become a new appendage. I got a copy of this book as I have a huge interest in the Viking era. And to that end, this is a great work to add to my library. On reflection, I maybe should have dipped into it in between other books, rather than read through it in one go. After a few chapters, it all started to become a little bit familiar and stodgy - one king harried here and there, married, and then died; then the next king harried here and there, married, and then died. I do not think this is a book for general readership per se - those looking for exciting Viking tales should try the Icelandic sagas instead - but for the history buff, this is a good work to add to one's collection. Ignore the rather suspect black gothic text against a red background - this is an interesting book.So far, the first bit, "The Saga of the Ynglings" consists of along series of basically crap kings who rule for about five minutes each. They all die in a ludicrous manner - one drowns in a vat of mead while wandering around (drunk) to look for a place to take a pee, one gets lured into a cleft in a rock by a dwarf (while drunk) and is never seen again and others die by bull attack and nightmare. If Snorri's the Herodotus of the Middle Ages, this is his "Histories." Meaning, it's THE masterwork of epic nonfiction narrative prose for its time. Debate its accuracy all you like: it's a goddamn awesome read. This edition, from U of Texas Press, translated by Lee Hollander, is the one to get. Anything Scandinavian from Hollander or U of TX is top-notch, actually: the best edition of the Poetic Edda, for instance. Try the Saga of the Jomsvikings, too. Great book.Great stories of the Lords of Norway. Went into great detail of battles as well. It doesn't go into modern history though but this doesn't bother me. Fascinating history of Northern Europe (Norway, Denmark, Sweden) in (mostly) 10th to 12th Centuries. Lots of historyThis book contains the oldest history of the Norwegian kings and of the Norse people. Anyone who has Norwegian heritage needs to read this book! It is a good book and a beautiful edition. I read the Norwegian "Storm" edition. Good book but a hard read. Mostly because the narrative style or flow were that of old texts from about the 1100s and the book itself were worked on and rejigged in the late 1800s.Very interesting if you're into this sort of thing. Yes I took a long time to get through it but hey I wasn't doing it for school or anything. just for my own personal reasons. 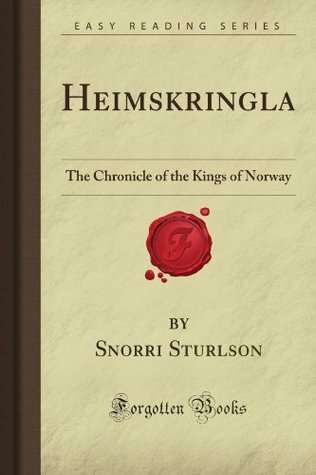 The Heimskringla is a must read for any one interested in Norse history and Lore....however this is a large body of work comprising the lives of the Norse rulers and it is not for the light hearted and in my opinion you must have more than a passing interest in Norse history to a) fully commit to this book and b) fully appreciate its contents. To the potential reader I would recommend to first read the Eddas (certainly the Prose Edda) and get a few Sagas - be they legendary or Icelandic - under your belt (Laxdaela Saga, Volsunga Saga or Egils Saga would be my recommendations) before attempting the Heimskringla purely to get an understanding of Norse mythology and literature and to get used to the form, prose and construction of the literature. Having said that, though the stories told are Sagas in their own right, the Heimskringla is also much unlike the Icelandic Sagas in its content and is of a much more epic scope akin to the Gesta Danorum. It is very much a fulfilling read, however it does take some time to accomplish. I have this edition in my library, however it is an old translation that definately needs sprucing up as it can seem quit dry....I have heard good things about the L. Hollander translation which may make for a lesser labour intensive read. was going through a phase where i'd read everything by tolkein. and had started into the ancient texts that had inspired him. The heimskringla, the kalevala, beowulf, and such. there are elements of epic storytelling that you will find very familiar, and that make it easier to read than you'd think. and learned that my scandanavian ancestors were pretty brutal. Le saghe norrene, nella loro forma originaria, non sono molto interessanti, nel senso che non sono molto avventurose. Sono una lunga sequenza di eventi e genealogie che hanno un interesse per lo più filologico e legato agli studi di mitologia e linguistica. Non attendetevi granché da questa lettura. I loved it and I reread it often. Battling Norsemen, sly plotting, berserk rage, sailing to new lands for adventures. And with occasional weird poetry thrown in by the major characters! And for some strange reason, the genealogy had its own fascination. And it's all supposed to be true (although obviously there's artistic licence on the part of Snorri). What's not to like? For anyone interested in the Norse history and literature this book is a must. However, it takes the patience of a historian to follow all the details on the lives of kings of Norway - a patience I did not have. It is from Snorri the Icelander that we received the written inheritance of the sagas, tales of the Norse, and these collections of Viking religious and philosophical thought read like a northern Proverbs. This is quite an interesting read and to think I just came upon it whilst reading Jules Verne's 'Journey to the Center of the Earth'. Actually at first I had no idea that the text existed but finally decided to look it up. This is the definitive saga of the Norwegian kings. It's enormous, so it may take quite a long time to get through, but my trip inspired me to explore all things Scandinavian. This 'brick' of a book is historically interesting. Recommended for anyone who may strive for further understanding of the creation of the Norway as one nation in the viking era and beyond. Amazing. Review to follow when I have time.